There’s no doubt that starting a home business has many perks. You get to be your own boss. You can work how and when you want. You set your own fees, essentially earning what you’re worth. But there are a few drawbacks that many home-based entrepreneurs forget to mention. You’ll Get Less Respect or Be Asked When You’re Going to Get a “Real” Job: Although this is a little less than it was 10 years ago, for some reason, many people don’t view home businesses as legitimate career choices. Instead, it’s something people do on the side to make a few extra bucks, or until a real job comes along. People Will Think You Have All the Time in the World to Do Them a Favor: Because you work from home, you must have time to let the cable guy in for your neighbor, pick up your sister’s kids at school, and have lunch with your mother. To avoid becoming the go-to, on-call helper, have set work hours and be a stickler to others about respecting them. You’ll Use More Mental Energy Than at a Job: While jobs do require mental energy, owning a business, in which you’re in charge of every aspect, and your success is dependent on how well you manage it, means you think a lot about your business. Even when you’re not working, you’re thinking about it. Work Isn’t Always Fun: Even if you start a business doing something you love, there are aspects that aren’t fun. Some of these tedious jobs can be outsourced to a virtual assistant, but even then, you’ll have days where you don’t like your business. Work Is Rarely Ever Done: Calendars, schedules, routines, and to-do lists will help you stay on top of tasks, but you’ll probably never come to the end of your list. You’ll Sit More: Because you don’t have to get up, get dressed, and commute to a job, you’ll move less. Unless your home business is in landscaping or fitness training, you’ll likely spend a great deal of time at your computer. This can lead to weight gain and related health issues. In fact, health experts indicate that sedentary workers don’t need to exercise more, they just need to sit less. So get up more often. 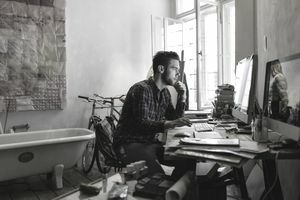 Work and Life Blur: Having your career in your home means it’s easy to work when you’re off and be off when you’re supposed to work. While flexibility can be an advantage of running a home business, if you’re not consciously making decisions about work and off time, you can begin to feel overwhelmed and scattered. This is where time management can make a big difference in the quality of your work and personal life. It’s Lonely: The quiet and solitude of a home business are nice for being focused and productive, but it’s lonely too. There’s no water cooler for gossip or feedback from a colleague. Social media and online groups can help with this, but it’s important to make an effort to connect with people in real life. This can be done through live networking events, co-working facilities, or MeetUp groups. It Gets Harder to Go Back to a Traditional Work Situation: Once you get used to having your own schedule and working without a boss, it gets difficult to want to go back to that situation. You’ll Work Too Much (or Maybe Not Enough): Especially in the beginning, home businesses take a great deal of time to get up and running. You may not have a day off for weeks or months. This can cause problems with your family. Or, it’s possible you’ll not work enough. A home business is flexible, but not so flexible that you can make a living during your child’s nap times or working only an hour a day. Some Days You May Not Get Dressed: Working in your pajamas is a perk of having a home business. But spending the entire day in your "jammies" will make you feel frumpy. Many experts suggest a morning routine for your home business just like you would have for your job; shower and get dressed. You’ll Be Home All the Time: Living and working under the same roof can get tedious. On the days you don’t get dressed, it also means you don't leave the house. Fortunately, many home businesses can be run from other locations and since many public spots have free wi-fi, you can take your work on the road for a change of scenery.